Happy Friday! The weather has been wonderful the past couple of days in Portland and my mood has significantly lifted because of it. I've been spending as much time as possible on our little patio soaking up the rays before our temperatures dip again. I even wore shorts yesterday! But even though we are seeing some unseasonably warm weather, I wanted to share a spring worthy look that is made up of layers for those of you who are still battling with cooler temps! | LIGHT NEUTRALS | I wanted to mix tones that were very similar but not necessarily monochromatic. Brighter tones help keep the look feeling fresh and spring appropriate even if the weather is not cooperating. Depending on where you live and how your seasons operate it may be a good idea to invest in a light color outer layer as well as some medium to lightweight sweaters. I've found that having a couple of these pieces helps me fight my spring wardrobe envy when I see others wearing beautiful spring dresses and short sleeves! | TEXTURES | I love the textures that make up this look. I seem to always overlook texture when putting an outfit together. It can make a simple outfit much more dynamic without going overboard with shape or harsh contrasts. 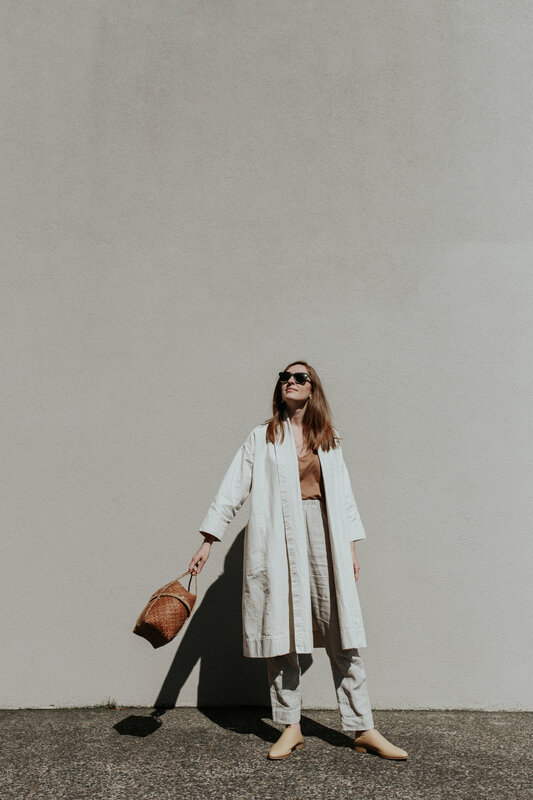 The natural and earthy vibe from the flax linen pants is a nice casual contrast to the cotton canvas trench and then the basket bag is a fun addition to add a weave component. | STATEMENT PIECES | When I look at this outfit the trench coat definitely stands out as the main focus but I love the pops of caramel from my tee and basket bag. Even though they're smaller and more subtle elements, the fact that the colors tie together so well makes them a statement of their own. It also helps break up all of the natural cream components. | BALANCING OVERSIZED SILHOUETTES | Oversized pieces are my best friend but sometimes they can be a little overwhelming. For this look I kept the base simple with a tapered leg pant and tucked in tee. This doesn't compete with the coat and is super cute when worn by itself. I also wanted to make sure to have a handbag that would stand out with this outfit and not get baried. If I had worn a small crossbody it would have looked disproportionat to the rest of the look. I want to say a special thank you to Madeline Metcalf for taking all of these beautiful photos! You are truly talented my friend and I can't wait to see where life takes you!